In the hands of Tyler__Durden. Use TB1P9VP to reference this item. 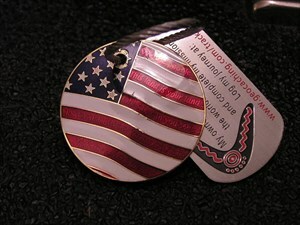 This coin would like to go to caches in all 50 states to spread the word about biker awareness. If you have a bike of any type post your picture of you and your bike and helmet with this coin. This coin is being released in loving memory of Todie Phillips of Manitou Beach, Michigan--Tod of Team Rod and Tod w/KAboom...the Cachestalkers. Tod died in a tragic motorcycle accident on August 12, 2008 when a truck turned in front of him and he tried to avoid it. Sadly Tod was wearing a novelty helmet when he died that wasn't DOT approved. LOOOOOTS of muggles around, but was sly enough to find it. We were fortunate enough to discover this one while it was in the hands of RuthieB71. Thanks for sharing it with us. This one will be moving out of state. Great coin with a special mission. Found this great coin with a special story. Will be moving it out of state in a few weeks! SPOTTED IN THE HANDS OF DOJAY. beautiful coin. 2nd biker coin we've seen. I see it's not been in western states. Heading out to Co., California area will take it out with us. Thanks for poem and sharing this coin with us.